Spend the 4th (Fri) among aquatic life with a scuba or snorkeling tour. The adventure continues: go for a stroll along the water at Hamilton Island Marina, don't miss a visit to Passage Peak, explore the galleries of Hamilton Island Art Gallery, and enjoy the sand and surf at Catseye Beach. For maps, more things to do, ratings, and other tourist information, refer to the Hamilton Island online trip planner . Melbourne to Hamilton Island is an approximately 4.5-hour flight. You can also do a combination of bus, car, and ferry. Traveling from Melbourne in October, you will find days in Hamilton Island are a bit warmer (31°C), and nights are much warmer (25°C). 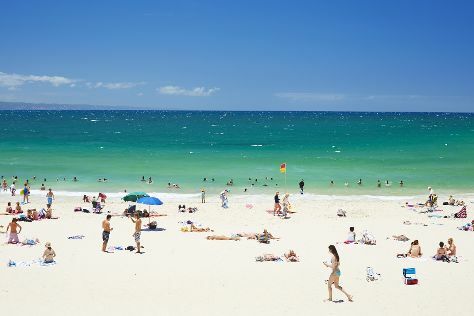 Wrap up your sightseeing on the 5th (Sat) early enough to travel to Noosa. Explore Noosa's surroundings by going to Mooloolaba (HMAS Brisbane & Mooloolaba Beach) and Kings Beach (in Caloundra). Spend the 7th (Mon) exploring nature at Noosa National Park. There's lots more to do: stroll through Noosa Main Beach, make a trip to Hastings Street, and take some stellar pictures from Laguna Lookout. For traveler tips, maps, where to stay, and tourist information, read Noosa tour planning app . Do a combination of flight and train from Hamilton Island to Noosa in 7 hours. Alternatively, you can do a combination of ferry, bus, and train; or do a combination of ferry and bus. Finish your sightseeing early on the 8th (Tue) so you can travel back home.